This time, more memories of what I did rather than observations. I remember waking up at 6am, but I was unable to get out of bed for 10 minutes because it was so cold. However, I was glad I did. When I finally got out, I saw my mum watching the television and Germany was in the lead by 1-0. I was ecstatic. And then something crazy happened - 4 goals were scored in something like 5 minutes. Total Brazillian mental meltdown - it seemed like everything was being played in slow-motion and the Germans were just literally strolling the ball through the a park. I really don't know what happened. Was it really that bad without Thiago Silva and with Dante instead? Even though I guessed Germany would win, I had no idea that was coming - who did? Someone has joked on twitter that the soft drink 7-up is now banned in Brazil. I think I woke up late for this one too. I was so disappointed. I left at about the 70-minute mark for work; and even as I got to work, extra-time was still ticking. I was greeted with a colleague coming from next door to inform me that the Netherlands had just missed the first penalty (Vlaar). Then, shortly after that, I read a match update that Netherlands had missed yet another penalty. I was shaking my head. Then, whilst I was walking down the corridor, someone broke the news to me that it was official: Argentina had just scraped through. I was surprised that the Netherlands didn't sub Krul back on - I wonder what the reason for that was? In any case it probably wouldn't have made a difference because of their poor penalty misses. Serves me right for going with "my heart". But it makes sense if you think of Argentina and Netherlands being frightened by the Brazil-Germany match and not wanting to concede like that. I have always though of third-placed matches as a bit of a farce; it's essentially a dead rubber. Nonetheless, I expect the Brazillians to regroup against a rallied Netherlands. There was a good comment that suggested the winner of the 3rd vs 4th place spot should qualify automatically for the next World Cup finals. Perhaps the Winner and Runner-up should also automatically qualify. It would obviously make the 3rd place fight more competitive. In some ways this reminds me of the Europa league - I am so glad that they changed the rules to stipulate that the winner of that competition from the 2015-16 season onwards will qualify for the Champions League. Germany's last trophy was in 1990 whilst the Argentinian's last trophy was 1986 so both have had to wait a fair bit, but it is all relative I suppose given that you can only have so many winners with a competition held every 4 years. Interestingly, each team lost to the other to grab their respective title in 1986 and 1990. 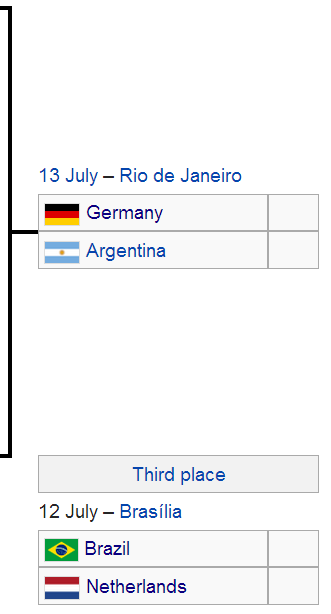 Argentina will play well because they want to win on Brazilian soil. They won't be so easy to get through and will be tough opponents for Germany. However, I expect Germany to prevail in a classic encounter, 2-1. Germany has to be careful though. 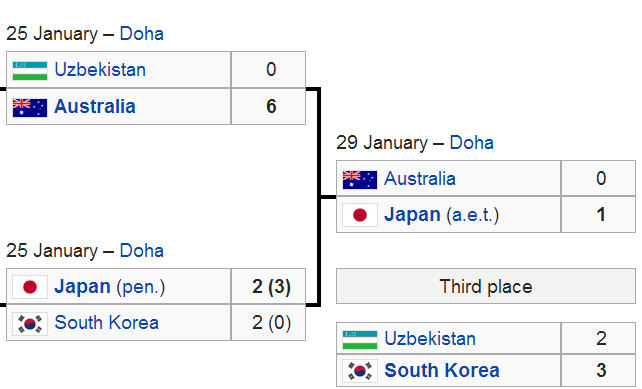 A rampaging victory can actually be fatal (it produces overconfidence) as was demonstrated by Australia's crushing victory over Uzbekistan and subsequent loss to Japan in the final in the 2011 AFC Asian Cup. Obviously the standard was different but the principle still applies here.